Moving from car sales into the leisure vehicle sector, Rod joined the Southdowns sales team in 2013. A I joined Southdowns in 2013, having helped out at the Motorhome and Caravan show at the NEC in Birmingham in October. I really liked the idea of the motorhome industry and going to the show was a real eye-opener. I’ve known Andrew Ayling socially for years and having spent the last 12 years running my own car sales and repair business, I was looking for a new challenge. People generally buy a car because they have to - which makes car sales pretty unexciting. Motorhomes are completely different; they are aspirational and every customer’s story is different. Basically we are selling fun. A As a motorhome sales specialist my day revolves around meeting and greeting customers, ascertaining exactly what their requirements are and offering sound advice to match them with their ideal motorhome. I also coordinate the preparation and upgrading of vehicles prior to collection and supervise the motorhome handover, explaining all the systems and accessories to the new owner. A I love the products we sell and the relaxed environment in which we sell them. Southdowns is very much a family business and this ethos is evident throughout. The whole team are happy to be here - which is quite rare these days. A I have spent a lot of time travelling and sailing and I love the whole idea of self-sufficient travel, as well as the technology and the innovation that goes into motorhomes to make that possible. 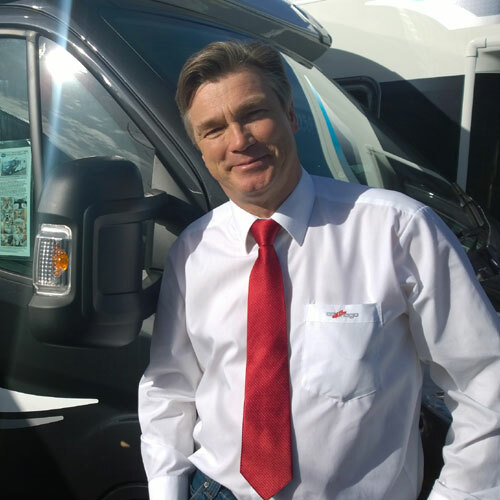 I have sold motorhomes in the past through my own business so I’m familiar with a lot of the systems and how they work - that technical knowledge is proving very useful. A I’ve not been outside the UK in a motorhome yet but would love to take one to Europe. love the Italian mountains and the Amalfi coast. Croatia and Turkey also have wonderful scenery so they would also be on my list of places to visit. A. Honesty and a smile will take you anywhere you want to go. Most people want the same things: peace, comfort and companionship - I always try to bear that in mind, even when I’m dealing with a difficult customer - we do get one or two! Rod lives in Shripney with his wife Catherine and his sons Chester and Franklin. When he’s not working, as well as hoping to get back into sailing he is also a drummer in a local rock band.